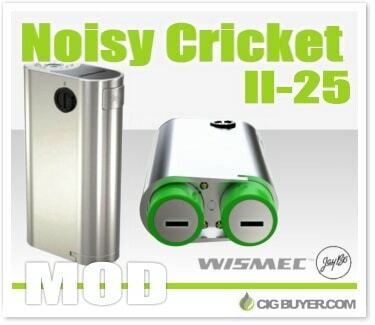 The original Wismec Noisy Cricket Mod was quite a sensation when it was released last year, and this popular mechanical mod has been completely overhauled. The Wismec Noisy Cricket II-25 Mod is safer and more intelligent, with the ability to run the dual 18650 batteries in series or parallel. Multiple circuit protection helps to minimize the risk of a traditional mechanical mod, and not only are there two different options in series mode (Direct Output and Constant Voltage), but there’s a power indicator light on the firing button and a rotating switch on the side to adjust voltage.